Check out the video below by Minnesota Public Radio for an account of the events that took place after Anti-Flag's set. 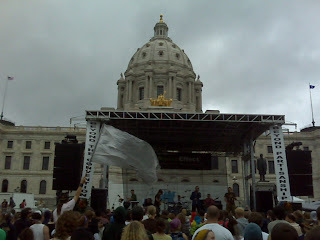 *FYI- It has been reported that Anti-Flag and RATM did not have a permit to play at the Capitol. These reports are NOT accurate. This event was granted a permit which allowed any and all artists to perform at the discretion of the event organizers. 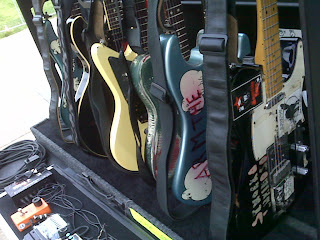 Both Anti-Flag and RATM were invited by the event organizers to play this show. This is scary that we live in a society that opperates as a police state and where are freedoms and liberties can be taken away so swiftly and without just cause. It really reemphasizes why I choose to live my life around being informed and activism. I think it's very inspiring what RATM did. Instead of giving up on getting their message out they found another way to do so, at the same time sending the message to the government that we will not be silenced! Really, I don't think they could have picked two better bands to perform at the RNC. We need more people in this country... in this world for that matter, with your spirit. On another note, I feel for the protesters who were brutalized and arrested by Riot Control. The majority of the protesters were peaceful. While watching the interview with Amy Goodman, Sharif Abdel Kouddous and Nicole Salazar of Democracy Now! and other videos of the police using tear gas on the protesters, striking the protesters, etc. The only thing I could think was... "This is what a police state looks like." All those times when I see this blog a name flashed into my mind, it is Dr. Morice ..